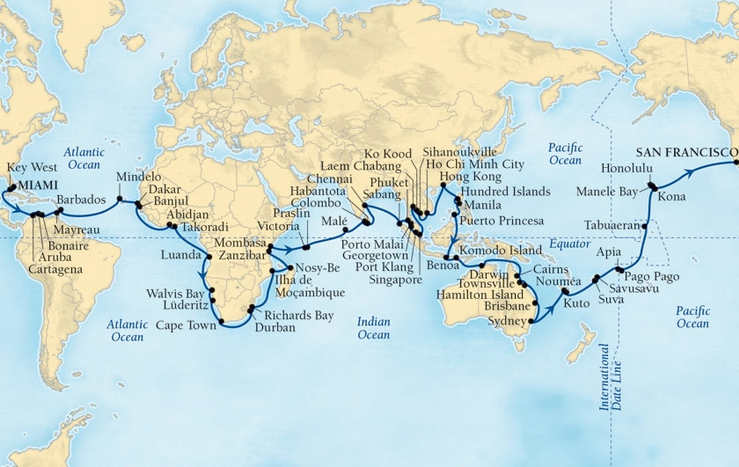 Seabourn’s first World Cruise in six years circumnavigates the globe from North America, transporting an intimate group of like-minded travelers to 62 ports on five continents — more than one port for every sea day. Exclusive events, along with overnight stays and late departures from dozens of ports allow you to immerse yourself in a world of fascinating people and unforgettable places, all in incomparable elegance and ease, on board the stunning Seabourn Sojourn. Dozens of marquee cities including Dakar, Abidjan, Cape Town, Durban and Mombasa; Madras, Singapore, Ho Chi Minh, Hong Kong and Sydney. A wealth of hidden gems includes Mindelo, Luderitz and Ilha de Moçambique, Nosy Be and Praslin, Hamilton Island, Ile des Pins and Manele Bay on lovely Lanai. Midvoyage excursions along the way in Namibia, India and South Africa. Safari options from Cape Town, Durban and Mombasa, numerous UNESCO Partner Tours including the World Heritage Site of Ilha de Moçambique, luminescent caves in Puerto Princesa, snorkeling in the Great Barrier Reef and more. Learn about regional markets with an expert Seabourn chef as your guide, in select ports such as Barbados, Mayreau, Manila, Phuket, Ho Chi Minh City, Cairns, Sydney and more.